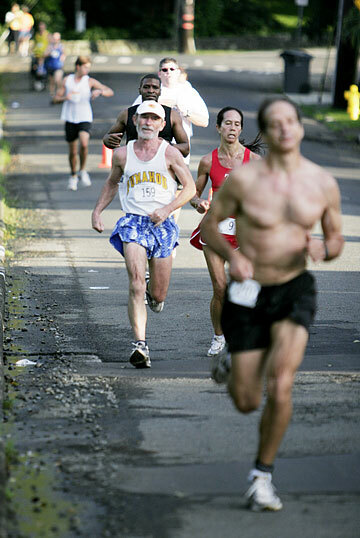 Runners competed in the 10th annual Faerber's Flyers 5K Run/Walk in Manoa on Sunday. Hawaii sophomore outfielder Brandi Peiler was named the Western Athletic Conference Player of the Week for softball yesterday. Peiler, a transfer from Hawaii Pacific, went 7-8 for a .875 batting average in four games against Grambling State and San Jose State last week. She has a six-game hitting streak and also had the game-winning hit in the Rainbow Wahine's WAC home opener against San Jose State. Hawaii (21-13, 5-0 WAC) hosts New Mexico State (21-3, 4-2) this week. The opener is 6 p.m. Friday, with Saturday's doubleheader starting at 2 p.m.
Hawaii, riding a school-record 15-match winning streak, remained No. 3 in the CSTV/AVCA Coaches Top 15 poll yesterday. The Warriors (19-4, 15-4 Mountain Pacific Sports Federation) received one first-place vote for the third consecutive week. UC Irvine received the remaining 15 first-place votes to stay No. 1, and the Anteaters were followed by No. 2 Brigham Young. Hawaii finishes out the regular season at home, with two matches against unranked UC San Diego this Friday and Saturday, and two against BYU April 15-16. Blane Muraoka tossed a five-hitter over seven innings to lead Oahu to a 9-1 victory over Maui in the Americans of Japanese Ancestry Baseball Championship Tournament on Sunday at Vidinha Stadium on Kauai. Muraoka was named the MVP as Oahu swept the tournament honors. Jacob Yoro won the batting title, hitting .667, and Matt Shido finished as the RBI leader with four. In Sunday's final, Ricky Tahara drove in three runs, with an RBI-single in the second and a two-run single in the fifth.